Back in 2015, I opened a review of Star Hammer: The Vanguard Prophecy with that classic Battlestar Galactica line. 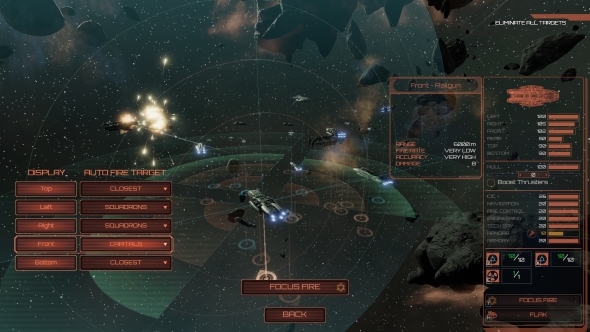 The game was reminiscent of the beloved mid-2000s TV show, its turn-based tactical combat replicating the feel of the Galactica’s busy Combat Information Center (CIC). 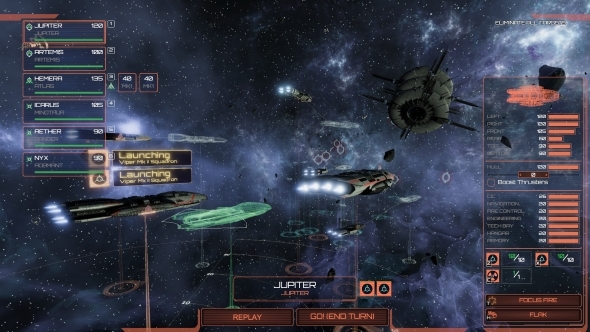 Two years on, and developers Black Lab Games have turned that feeling into its own game: Battlestar Galactica Deadlock. Spool up your FTL drives and jump into the best space games on PC. It’s no huge surprise to discover that Deadlock is, at its core, simply Star Hammer with Cylons. Presentation aside, the game uses the same WEGO simultaneous turns system as Star Hammer, meaning battles are both tactically rich and very accessible. Select a ship, tell it where to move, designate targets, and tap the end turn button to see it all play out in motion. This time, of course, it’s all rendered in the dull, muffled sounds of machine gun fire that is so iconic of Battlestar Galactica. While the basic concepts of battle are identical to Star Hammer, the BSG theme of Black Lab’s new game is more than just a paint job. Set during the First Cylon War, you play as the Executive Officer reporting to Lucinda Cain (relative of Battlestar Pegasus’ Admiral Cain) in the wake of a Cylon attack on the Twelve Colonies. Between missions you’ll find yourself located in the CIC of the Daidalos, a massive shipyard that you’re required to keep permanently protected. In terms of visuals, everything is in the right place: the big war table surrounded by glass panels, the Kobol colony symbols, and, of course, the corners missing from every sheet of paper. But it’s what you do in the CIC that proves Black Lab learned from Star Hammer. Instead of a basic string of missions with branching options, Deadlock functions more akin to a Total War campaign. 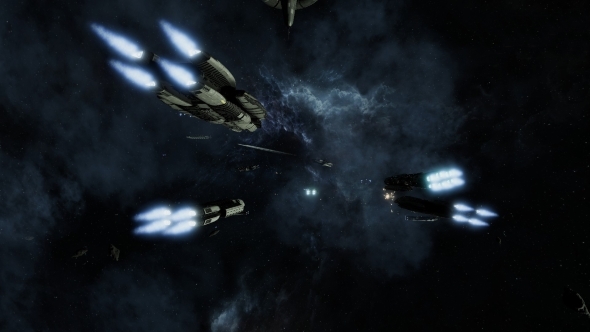 You have a key fleet that flies around with the Daidalos, and can manufacture other fleets as the campaign progresses. These groups of ships can move between the four clusters of the Helios system, traveling to the 12 colony planets via FTL jumps. While there are core story missions, much of the game is spent skirmishing with the Cylons as they appear on this war map. Taking what appears to be inspiration from XCOM, each of the colony planets have an escalating panic status. Ignore too many Cylon raids on Caprica, for instance, and the planet will withdraw from the alliance. This will cut short your income, making it increasingly difficult to maintain your ships and keep other colony worlds protected. This certainly keeps up the pressure, and maintains the Cylons as the threat they’re portrayed to be in the show. Talking of the Cylon threat, your enemies have a clever trick that neatly ties into Battlestar Galactica lore. In the show, set during the Second Cylon War, no ship in the fleet uses the internet: every computer system is isolated. This is to prevent Cylons from hacking a ship and taking complete control. Due to being set during the First Cylon War, though, such prevention measures have yet to be made. Thus, Cylons can hack your ships. This causes all kinds of disasters in combat; hangars are shut down, denying you the ability to launch Vipers, and targeting systems are fried to prevent you from shooting enemies. It’s a nice lore touch, but more importantly it provides moments that hit just the right amount of panic. Like the show it’s based on, Battlestar Galactica Deadlock is made on a tight budget and has to make effective use of a small collection sets and props. Despite that, it manages to hold its own. The tutorial is finicky and some of the mechanical presentation misses the mark, but its a novelty to play a tie-in game that’s not a dreadful mobile game. Deadlock may be small, but it really does capture the feeling of being on the back foot, which is what Battlestar Galactica is all about.